High-accuracy age estimations of tsunami deposits are very important for tsunami deposit research because the recurrence interval and frequency of tsunami deposits allow us to assess the devastating impacts of tsunamis in a populated country such as Japan. The correlation of tsunami events between remote coastal areas further enables us to constrain tsunami scenarios and fault segmentation along a trench. Before the 2011 Tohoku-oki earthquake, the long-term tsunami history along the Sanriku Coast was not well known. Age data of the long-term tsunami history are essential to understand the mechanisms of tsunami generation and earthquakes and to assess the risks posed by them. This study re-examined the age of historical and paleo-tsunami deposits (E1 to E11 deposits) at Koyadori in the middle of the Sanriku Coast and estimated their ages with high accuracy by using continuous sediments since approximately 4 ka. Radiocarbon dating was conducted in combination with other radiometric dating methods (137Cs and excess 210Pb) to estimate the ages of the sediments. The resulting ages revealed the reliable ages of ten historical and paleo-tsunami deposits. The average recurrence interval of historical and paleo-tsunamis in the last 4 ka is 350–390 years, and each recurrence interval between the E4 and E11 deposits is similar despite the tsunami deposits having different characteristics. Moreover, far-field tsunamis do not seem to inundate this site based on the observed and documented records. The continuous and long-term data of tsunami deposits at Koyadori offer important constraints on the timing and frequency of near-field earthquakes (e.g., megathrust, outer-rise, and tsunami earthquakes) around the Japan Trench. One of the goals of tsunami deposit research is to reveal when, where, and how a tsunami occurred. Tsunami deposits are first identified on the basis of various criteria (e.g., Goff et al. 2012), and then analyzed to estimate the ages of the sediments. However, high-precision and high-accuracy age estimations of tsunami deposits are usually difficult owing to the varied preservation of the sediments (i.e., preservation potential, dating material, and geomorphic setting). The age data of tsunami deposits are also significant because they are influential in several research areas (e.g., geophysics, history, geology, geography, and engineering) and society (e.g., risk assessment, hazard mitigation, and city development). For age estimations of tsunami deposits, radiocarbon dating is generally used, while other dating methods may occasionally be conducted. Radiocarbon dating is very useful; however, this technique may sometimes yield inaccurate values owing to problems such as contamination, disturbance of deposits, and preservation of dating material. Therefore, careful sampling and additional dating methods are required to be conducted. Koyadori, the research area, is located in the middle of the Sanriku Coast, where multiple historical and observed tsunamis have been reported (Watanabe 1998). The tsunami triggered by the Mw 9.0 2011 Tohoku-oki earthquake hit Koyadori, where an approximately 30 m run-up height was recorded (The 2011 Tohoku Earthquake Tsunami Joint Survey Group 2012). Ishimura and Miyauchi (2015) identified tsunami deposits within long and continuous deposits since approximately 4 ka and correlated some tsunami deposits with historical tsunami events at Koyadori, where the largest number of tsunami deposits on the Sanriku Coast has been found. Therefore, the Koyadori site can be a type location for the tsunami history along the coast and allows for a comparison of tsunami event ages and frequencies in Hokkaido (e.g., Nanayama et al. 2003) and around Sendai (e.g., Sawai et al. 2012). However, Ishimura and Miyauchi (2015) have not yet reported the high-precision and high-accuracy ages of the paleo-tsunami deposits owing to the reversal in the radiocarbon dates. Thus, the author added radiocarbon dating and integrated additional radiometric dating techniques (137Cs and excess 210Pb) after Ishimura and Miyauchi (2015). This study presents a re-examination of the ages of the historical and paleo-tsunami deposits at Koyadori. Koyadori is a small valley fill lowland facing a southern bay (Fig. 1). It is surrounded by alluvial fans, talus, and beach ridges, making it an appropriate site for a tsunami deposit survey (Ishimura and Miyauchi 2015). Ishimura and Miyauchi (2015) reviewed historical tsunamis at Koyadori and their run-up heights (Tables 1, 2, Ishimura and Miyauchi 2015). Before the 2011 Tohoku-oki earthquake tsunami, the 1896 Meiji Sanriku tsunami and the 1611 Keicho Sanriku tsunami were the largest tsunamis observed and documented since the Edo Period approximately 400 years ago, respectively. In the last 100 years, the 1933 Showa Sanriku tsunami also inundated the study site; however, the 1960 Chile earthquake (Mw 9.5) tsunami, a far-field tsunami, did not inundate the area. Although another large far-field historical tsunami, the 1700 Cascadia earthquake (Mw 8.7–9.2) tsunami, hit the Sanriku Coast, the tsunami height at Miyako and Otsuchi (Fig. 1) was estimated to be less than 5 m (Satake et al. 2003), which was equivalent to that of the 1960 Chile earthquake tsunami. There is no historical record for the region around Koyadori prior to the Edo Period. Ishimura and Miyauchi (2015) excavated a trench (hereafter the KYD trench) at Koyadori and identified 11 tsunami deposits (E1–E11), including the 2011 Tohoku-oki earthquake tsunami deposits (E1 deposits) (Additional file 1: Figure S1). They correlated some of the tsunami deposits to historical tsunami events using radiocarbon dates and a tephra (E2 deposits: 1896 Meiji Sanriku tsunami, E3 deposits: 1611 Keicho Sanriku tsunami, and E4 deposits: possibly 869 Jogan tsunami deposits). However, estimated ages older than the E5 deposits were not constrained owing to the reversal in the radiocarbon dates. Thus, Ishimura et al. (2016) examined a kind of material that shows the true sediment age within the marsh sediments at Koyadori using drilled core samples (Ishimura et al. 2014), because appropriate materials for age estimations (e.g., seeds, fruits, and leaves) could not be found from all horizons in the limited samples. Ishimura et al. (2016) compared the radiocarbon dates of various materials (e.g., plant fragments, seeds, leaves, and organic sediments) with the age of a tephra. Consequently, all plant fragments showed the same or younger dates than those of the organic sediments, fragile organic materials (leaves and seeds), and age of a tephra. On the other hand, organic sediments corresponded well with dates of fragile organic materials and tephra age, and indicated that the most part of the organic sediments at Koyadori comprised in situ organisms and that the influence of old carbon from the upstream area was less because the catchment area was narrow and hinterland geology did not contain organic materials. Samples from the KYD trench and the Handy Geoslicer (Nakata and Shimazaki 1997; Takada et al. 2002) (hereafter HGS) cores were used. Ishimura and Miyauchi (2015) excavated the KYD trench (a 12-m-long, 3-m-wide, and 2-m-deep trench) and used block samples (50-cm-long, 10-cm-wide, and 5-cm-deep) from the three trench walls: grid S-1.95 m on the south wall, grid E-11.75 m on the east wall, and grid W-2.75 m on the west wall (Additional file 1: Figure S1). According to the results of Ishimura et al. (2016), organic sediment samples from the block samples were dated. Sediments having a thickness of 1–2 cm were resampled for radiocarbon dating in the horizons that were nearly identical to those where Ishimura and Miyauchi (2015) sampled (Fig. 2). New radiocarbon dating of 27 samples was conducted via accelerator mass spectroscopy at the Institute of Accelerator Analysis Ltd. The obtained radiocarbon dates were calibrated using the OxCal 4.2 program (Ramsey 2009) and the IntCal13 calibration curves (Reimer et al. 2013). In addition, the event ages were modeled using a Bayesian analysis (Ramsey 2008). The HGS cores are drilled along the survey line in Fig. 1 at 2.5-m intervals (Ishimura et al. 2015). Tsunami deposits within the HGS cores had already been correlated with those in the KYD trench based on high-density array cores (Additional file 2: Figure S2). Samples of an HGS core drilled at 100 m from the KYD trench (Fig. 1) were used to measure 210Pb and 137Cs to constrain the ages of the young sediments near the surface. The block samples of the KYD trench were not used for 210Pb and 137Cs measurements because the E2 deposits were fragmentary, and strong artificial modification was expected in the trench. Thus, the HGS samples clearly showing the E1, E2, and E3 deposits were chosen. 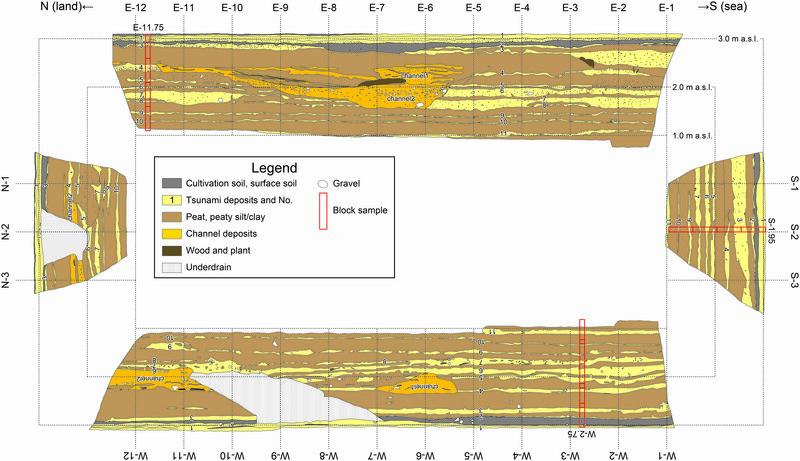 Samples were taken at 5–10-cm intervals because the influence of cultivation above the E2 deposits, as Ishimura et al. (2015) described (Additional file 2: Figure S2), cannot be negligible and these sediments were not expected to have high resolution. From these settings, 210Pb and 137Cs measurements were used as age constraints, and not for age determination of near-surface sediments. Six samples were measured using a gamma spectrometer at the Archaeological Research Consultant, Inc. Several soft X-ray images were also obtained using the HGS cores drilled at 40 and 72.5 m (Fig. 1), because the trench block samples were already used and disturbed, and thus, could not be used for soft X-ray images. Fortunately, sediments and their sedimentary facies between the E3 and E4 deposits in the HGS cores were similar to those in the trench. Then, the HGS cores were used instead of the trench samples. The measurement results for 137Cs and excess 210Pb are shown in Table 1 and Fig. 3. 137Cs is detected in samples 1 and 2 but not in samples 3–6. This indicates that the sediments above the E2 deposits contain 137Cs, which is produced by nuclear experiments that commenced after AD 1950s. The value of 137Cs for sample 1 is greater than that for sample 2, indicating that the sampled horizon of sample 1 includes the peak of 137Cs production (AD 1960s). The excess 210Pb shows a rapid decrease between samples 1 and 3, and is negligible or undetectable in samples 4–6. The decay of excess 210Pb indicates that sediments in sample 3 correspond to around AD 1900, meaning that the E2 deposits occurred around AD 1900 and the E3 deposits occurred at least prior to AD 1900. These age constraints are consistent with the previous correlations of tsunami deposits and historical tsunamis (E2: 1896 Meiji Sanriku tsunami and E3: 1611 Keicho Sanriku tsunami; Ishimura and Miyauchi 2015). However, there have been two inundating tsunamis (not counting the 2011 Tohoku-oki tsunami) in the last 100 years at Koyadori: the 1933 Showa Sanriku tsunami and the 1896 Meiji Sanriku tsunami. In this case, we can correlate the E2 deposits with both historical tsunamis. Conversely, Ishimura et al. (2015) discovered new event deposits (E1.5 deposits) between the E1 and E2 deposits that are below the cultivation soil in the HGS cores (Fig. 3, Additional file 2: Figure S2). From the 137Cs measurements, it can be interpreted that the age of E1.5 deposits is before AD 1960s. Thus, the E1.5 deposits might correlate to the 1933 Showa Sanriku tsunami. The E1.5 deposits are fragmentary owing to artificial disturbance and are distributed only in the well-preserved area downstream of the KYD trench, which corresponds to the inundation area of the 1933 tsunami (Earthquake Research Institute, the University of Tokyo 1934). Consequently, it is interpreted that the E1.5 and E2 deposits are most likely correlated with the 1933 Showa Sanriku tsunami and 1896 Meiji Sanriku tsunami, respectively. The 29 AMS radiocarbon dates obtained using organic sediment samples provide a chronology of the sediments in the KYD trench (Table 2). The age–depth plots are shown in Fig. 4 using depth information of each trench wall. For modeling ages of tsunami deposits, the deposition model “Sequence” (Ramsey 2008) is applied to estimate the ages of tsunami deposits (E3–E11) (Table 3; Fig. 5) using the OxCal 4.2 program, because sample depths in each trench wall do not match due to the change in lateral thickness, and thus the depth information is not used for age modeling. This program also calculates the model agreement index, Amodel, which indicates the likelihood of the estimates. Ramsey (2009) reported that an Amodel of more than 60% is acceptable. Initially, all radiocarbon data are used (hereafter Model A) and the model displays high-precision dates (Table 3; Fig. 5; Additional file 3: Figure S3). However, Amodel has a very low value (13.5%). In addition, the modeled date of the E3 deposits, which has been correlated with the 1611 Keicho Sanriku tsunami by Ishimura and Miyauchi (2015), is AD1330–1430. During the Edo Period, the 1611 Keicho Sanriku tsunami was the largest of the six documented near- and far-field historical tsunamis (Table 2, Ishimura and Miyauchi, 2015; Satake et al. 2003). Historical documents describing the 1611 Keicho Sanriku tsunami have been found in the Koyadori region (Earthquake Research Institute, the University of Tokyo 1989; Tsuji and Ueda 1995). Some studies have estimated the run-up height of the 1611 tsunami at Koyadori to be 20–25 m (Imamura 1934; Hatori 2009), indicating that the magnitude of the 1611 tsunami was similar to that of the 2011 tsunami. Therefore, the deposits associated with the 1611 tsunami must have been deposited at Koyadori and the E3 deposit is the only possible candidate. The inconsistency between the modeled date of the E3 deposits and the date in the historical documents may be due to the strong age constraints of Model A. Despite the tsunami deposits in the KYD trench showing erosive contact at the bottom (Ishimura and Miyauchi 2015) and sediments below the tsunami deposits possibly being lost, radiocarbon dates below and above the tsunami deposits (E3, E4, E5, E7, E8, and E10) are either very close or show inverse dates (Table 2). Therefore, it is possible that radiocarbon dates just above the tsunami deposits are older than the true sediment age owing to the deposition of secondary sediments just after the tsunami deposits containing eroded materials. From this point of view, density values gradually decrease above some tsunami deposits in block samples (Fig. 2), indicating that the sediments just above the tsunami deposits contain coarse materials (sand to granule) rather than peaty materials and that the contents of coarse grains decrease upward. Soft X-ray images also show that sediments above the E4 deposits contain more coarse materials compared to those just below the E3 deposits (Fig. 6). Radiocarbon dates of sequential samples (Sample Nos. 7–9) above the E4 deposits show nearly the same age (Table 2; Fig. 4), indicating rapid sedimentation. These compositions and dates support the hypothesis that sediments just above the tsunami deposits are secondary deposits just after a tsunami event. It is likely that rapid sedimentation above tsunami deposits by secondary deposits is typical at Koyadori because its topography is characterized by a depression that is surrounded by fans, talus, and beach ridges (Fig. 1). Therefore, secondary deposits by post-tsunami surface processes are easily deposited at the trench site, resulting in the contamination of old carbon just above the tsunami deposits. The radiocarbon dates of Sample Nos. 4–6 in the peaty sediments showing low density (Fig. 2) just below the E3 deposits show a sequential age order, indicating a slow sedimentation rate. These results and interpretations indicate that radiocarbon dates just above the tsunami deposits show older ages than the true sediment age. Conversely, the radiocarbon dates just below the tsunami deposits are likely appropriate for estimating the timing of the tsunami deposits. Although it is difficult to confirm whether all samples just above the tsunami deposits contain old carbon, another depositional model (hereafter Model B) is applied to estimate the more reliable ages of tsunami deposits using only the dates below the tsunami deposits (Table 3; Fig. 5; Additional file 4: Figure S4). Even though the tsunami ages from Model B are less precise than those from Model A, Amodel has a higher value (93.4%). In terms of the accuracy of the tsunami deposit ages, the ages estimated using Model B are more appropriate than those estimated using Model A. On the other hand, Goto et al. (2015) conducted a paleo-tsunami survey in Miyako, 50 km north from Koyadori, and discovered nine washover deposits interpreted as tsunami and storm deposits since 15 centuries. The study estimated each event age using 137Cs, excess 210Pb, and radiocarbon dating. Although Goto et al. (2015) identified more events since fifteenth centuries compared to this study, they indicated the occurrence of the 1933, 1896, and 1611 historical tsunami deposits identified in Koyadori. However, there were too many washover deposits in Goto’s site, and thus it is considered that they could not distinguish between the tsunami and storm deposits clearly. Thus, we need more information on tsunami deposits along the Sanriku Coast for establishment of paleo-tsunami history. The average recurrence interval of tsunami deposits is calculated to be 350–390 years using the modeled date of the E11 deposits in Model B and the number of identified events at the trench site. At Koyadori, the distribution of tsunami deposits implies a tsunami larger than the 1896 Meiji Sanriku tsunami or the 1933 Showa Sanriku tsunami because (1) Ishimura and Miyauchi (2015) found very thin tsunami deposits, meaning that the preservation potential of sediments is high and (2) Ishimura et al. (2015) discovered the E1.5 deposits and correlated it with the 1933 tsunami, which were supported in this research. As for far-field tsunamis, the 1960 Chile earthquake tsunami did not inundate Koyadori (Ishimura and Miyauchi 2015). The possibility of inundation of the 1700 Cascadia earthquake tsunami is low because the tsunami height (less than 5 m; Satake et al. 2003) is same as that of the 1960 Chile earthquake tsunami. Therefore, it can be assumed that the tsunami deposits at Koyadori only reflect near-field tsunamis containing various tsunami types triggered by earthquakes such as megathrust earthquakes (e.g., The 2011 Tohoku-oki earthquake tsunami), outer-rise earthquakes (e.g., The 1933 Showa Sanriku tsunami; Watanabe 1998), and tsunami earthquakes (e.g., the 1896 Meiji Sanriku tsunami; Watanabe 1998) around the Japan Trench. This also means that the risk of tsunami hazards along the Sanriku Coast has likely been more severe than the risk of strong ground motion by earthquakes for the past several thousands of years. As for the age interval, the age distribution of tsunami deposits, except for the E3 deposits, displays almost equal intervals in Fig. 5, meaning that the E4–E11 tsunami events have occurred at nearly the same interval. Even though paleo-tsunamis can be triggered by several types of earthquakes, the nearly constant age intervals indicate that the tsunamigenic earthquakes that occurred off the Pacific coast in Northeast Japan are tectonically related. However, the age intervals in the most recent one thousand years vary (Table 4). If the established correlation with historical tsunamis (E2: 1896 Meiji Sanriku tsunami and E3: 1611 Keicho Sanriku tsunami) is correct, the age intervals are 115 years (E1/E2), 285 years (E2/E3), and 631–951 years (E3/E4); this trend is different from that between the E4 and E11 deposits. In the future, detailed characterizations of each tsunami deposit will be essential to understand the source tsunamis and tsunami types. Radiocarbon dating and measurements of 137Cs and excess 210Pb in the KYD trench samples and HGS cores were conducted to determine and constrain the ages of tsunami deposits at the Koyadori site along the Sanriku Coast in Northeast Japan. On the basis of measurements of 137Cs and excess 210Pb, the E2 deposits are most likely correlative to the 1896 Meiji Sanriku tsunami. To estimate the ages of the tsunami deposits older than the E3 deposits, the age of each tsunami deposit was modeled using all organic sediment radiocarbon dates. However, these ages were systematically shifted to older ages due to contamination from old carbon transported by post-tsunami surface processes. An alternative model was then suggested using radiocarbon dates obtained just below the tsunami deposits, resulting in more accurate age estimations than was found with the previous model. This second model estimates an average recurrence interval of 350–390 years during the last 4000 years. On the basis of the inundation area of each historical and observed tsunami, it can be assumed that the tsunami deposits at Koyadori can only be attributed to near-field tsunamis along the Sanriku Coast (e.g., the 2011, 1933, and 1896 tsunami types). Even though source tsunamis include several types of tsunamis, the almost constant recurrence intervals between the E4 and E11 deposits at Koyadori indicate that tsunamigenic earthquakes off Northeast Japan have related mechanisms. The recurrence intervals between the E1 and E4 deposits are variable; therefore, we should collect more data on the ages of paleo-tsunami deposits to constrain the frequency, age interval, and mechanism of the earthquakes along the Japan Trench. DI would like to thank Fumihiko Imamura, Shinji Toda, Kazuhisa Goto, Daisuke Sugawara, Yuichi Niwa, and Takashi Ishizawa for their helpful discussions, Noelynna T. Ramos for comments on an earlier draft of the paper, and Gento Shinohara and Eri Katayama for providing assistance with the soft X-ray images. DI would like to thank the two anonymous reviewers for providing valuable comments and suggestions, which were helpful for improving the manuscript. This work was partially supported by the Intramural Research Grant for Special Project Research from the International Research Institute of Disaster Science (IRIDeS), Tohoku University, and JSPS KAKENHI Grant Numbers JP26242033 and JP26882001. 40562_2017_77_MOESM1_ESM.jpg Additional file 1: Figure S1. Sketch of the KYD trench walls. The sketches were modified after Ishimura and Miyauchi (2015). 40562_2017_77_MOESM2_ESM.jpg Additional file 2: Figure S2. Sketch of the HGS cores and subsurface profile. The sketches were modified after Ishimura et al. (2015). 40562_2017_77_MOESM3_ESM.pdf Additional file 3: Figure S3. Output results of age modeling (Model A) using OxCal. The portion in dark gray indicates the probability distributions for the modeled dates. Under bars below the probability distributions show the range of 95% probability distributions for the modeled dates. 40562_2017_77_MOESM4_ESM.pdf Additional file 4: Figure S4. Output results of age modeling (Model B) using OxCal. The portion in dark gray indicates the probability distributions for the modeled dates. Under bars below the probability distributions show the range of 95% probability distributions for the modeled dates.